Club MoBay Combination VIP Arrival & Departure Service. Redemption Information: Upon arrival & departure, present a copy of your travel itinerary to the Club MoBay representative. Inclusions: Meet & Greet service, fast track through immigration & customs on arrival, fast track through immigration and security on departure use of the Club MoBay arrival & departure lounge. Exclusions: Transportation to/from your hotel, added amenities offered in the lounge at an additional cost. Additional Information: Upon disembarking the plane, descend to the bottom of the ramp and identity yourself to the Club MoBay Representative (wearing a turquoise, black or red uniform with the Club MoBay logo) holding a Club MoBay sign. 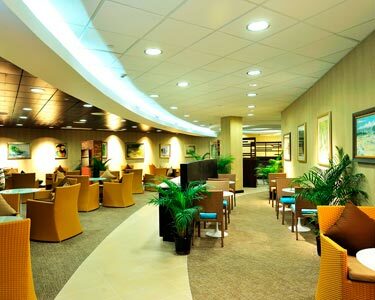 You will be escorted by a representative to the VIP Immigration & Customs fast track line followed by a visit to the Club MoBay Arrival lounge should you choose. The Representative will guide you to the ground transportation area. Please secure your departure tickets as they are required for entry into the Club Mobay Departure Lounge. Child Pricing: Children under the age of 2 are free; Children 2 - 12 years have a reduced rate. Advisories: Customers are responsible for informing us of any changes made to their original flight/travel itinerary as this is crucial to confirm your Club MoBay services. The Departure Lounge is open daily 6AM - 10PM. The maximum time that can be spent in the lounge is 3 hours; however if the flight is delayed, the total amount of time spent in the lounge is up to the discretion of Lounge Staff. Accessibility Details: Limited, prior notice is required to rearrange furniture. Restriction Special Notes: If your vacation package is a hotel only reservation (you did not book your air with us) your complete flight itinerary (airline, flight numbers, arrival time into Jamaica and departure time from Jamaica) is required at the time of booking. This information is crucial to confirm your Club MoBay service. Failure to provide accurate flight details will result in the cancelation of your Club MoBay service. Disclaimer: Use of Lounge is subject to Club MoBay's conditions. Inclusions are subject to change at any time without advanced notice (at the discretion of Club MoBay). Reservation Requirements: Reservations for your Club MoBay arrival & departure services are confirmed on your behalf. Club MoBay will present your with a departure ticket for entry into the departure lounge. Cancel Policy: Cancels within 48 hours of arrival will incur a 100 percent penalty. Child Policy: Permitted when accompanied by at least one adult.